BTW, you don't actually *need* to use an illegal way, it would be a choice, noone is holding a gun at your head saying "get this leaked version". From the overall quality of the MS software and expecially with this *new* ribbon interface (code name: Puzzle or how to make things more difficult to find) MS should actually pay people to use this! Addditionally and traditionally NO MS product in the last, say, ten years, was ever "ready for release" when actually released and actually started working only after one or two service packs, so getting a pre-pre-pre-release is particularly pointless IMHO. can be even make things worse! I thought ribbon looked better then "no buttons" UI which currently exist on Vista/7? About the puzzle UI, you're right it took me some time... I got a link (from somwhere) which had this video guide, sort of renewed my brain. 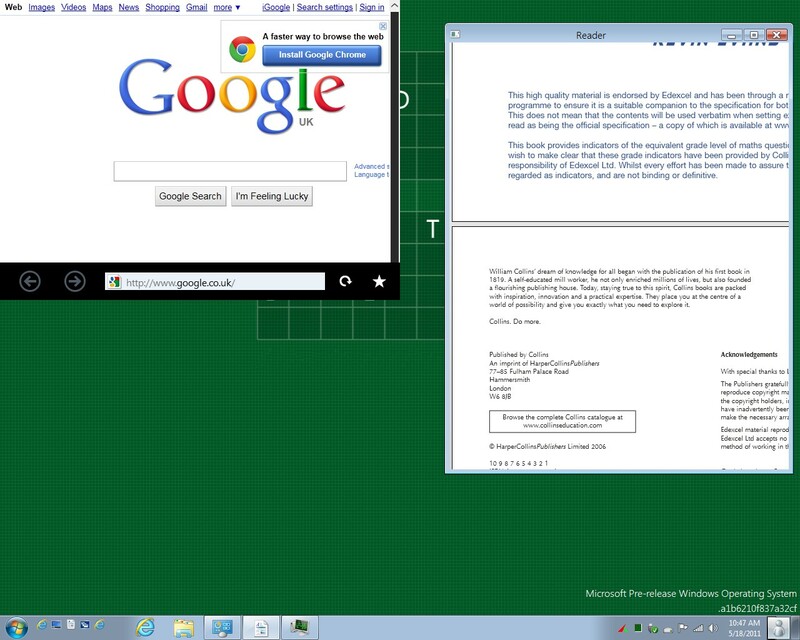 I didn't say I actually use Windows 7. EXACTLY for the reasons said, among others. "Production tools" should be productive. If you want to, say, watch a video on youtube or play a game, bloatware is *as good* as anything else, it will only be overall slower or requiring faster hardware. the leaked version talked about has been already supeceded by another leaked version, which is ALREADY outdated. Hah... I think MS is doing it on purpose... (and its not the very first time i felt this way). Maybe they do this to know how many devils out there to use "Devil's edition"
Not tested in ram, but sooner. But lost new version taskmanager and newly login feature after activated. This is just a testing purpose. Credit to brave guys who were sucked by MS for leaking those. 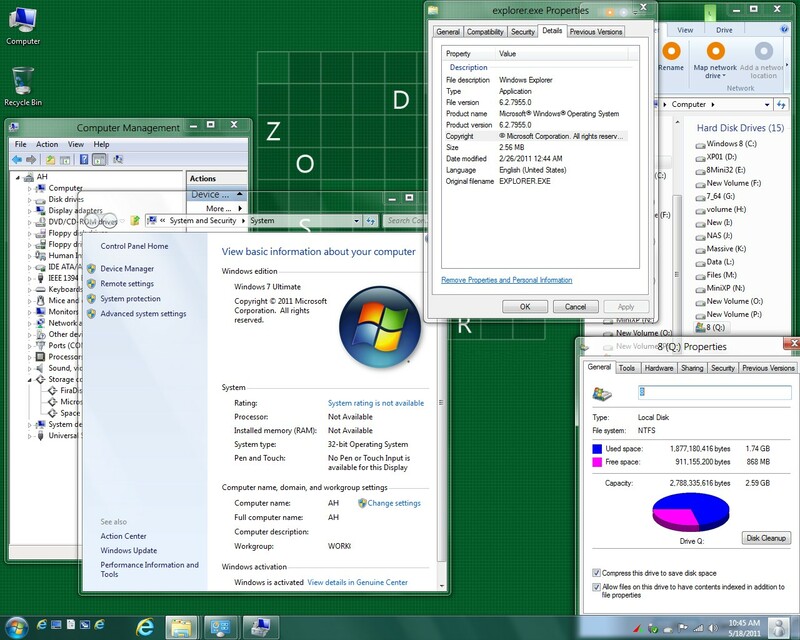 Actually windows 7 did not need to have a service pack to be usable or stable. Right from release is was extremely robust. I am a software developer and have been using it at work 8 hours a day / 5 days a week for the last year. Its not crashed once. Could not say the same for XP. One thing you can say for sure about windows 8 is that when it gets released in 2012 or 2013 then the UI will be different from what is seen in these early versions. That's the way its been for all windows versions - the final UI only appears late on in the beta cycle. the final UI only appears late on in the beta cycle. I agree with you. Here my developer version has the same UI as it appears. I've tried to shrink as much as I can and now it is my final state of barebone system. 0 byte in program files. Trying to make a ram boot version very soon.